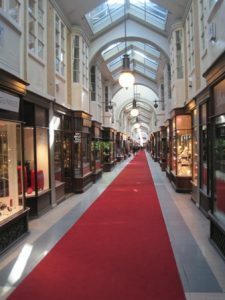 Burlington Arcade is an upmarket shopping arcade with an arched glass roof and dating from 1819. The Arcade runs north from Piccadilly to Burlington Gardens and is lined with about 40 shops selling clothing, footwear, jewellery, artworks and antiques. The arcade was built for Lord George Cavendish to prevent passers-by throwing oyster shells and other rubbish into his garden. The Arcade is patrolled by Beadles, formerly members of the 10th Hussars, but now ex-servicemen of any regiment. They wear a uniform of top hat and frockcoat, and their traditional role is to deter running, singing and the carrying of open umbrellas or large parcels.